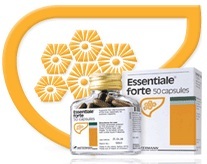 Essentiale contains 300 mg of essential phospholipids (EPLs) and is indicated for people with symptoms of liver disorders. It helps to protect the liver* by regenerating liver cells damaged by infection from certain viruses or by unhealthy lifestyle (heavy intake of alcohol, eating too much fatty food). Essentiale is the No. 1 selling liver supplement worldwide.